I must confess... my TBR pile has become more of a hill in recent years. Buried in that mound was ‘The Things They Carried’; a highly recommended book that always seemed to get sidetracked whenever I planned to give it a read. Trust me, I’m kicking myself for not getting to this sooner. It was a rare treat, one where storytelling, substance, and craft come together in some very fine writing indeed. This book is a collection of short stories about the unpopular Vietnam War, loosely (or maybe actually more specifically) written from the author’s own experience as an infantry grunt. Tim O’Brien has captured what few writers could about war: the uncomfortable, if not uncanny, truth. Yes, war is hell. War is also exciting, funny, boring, patriotic, confusing, enjoyable, numbing, negative, positive, and a frighteningly natural condition of humanity as well as a popular vehicle for the unreliable narrator. His short stories cover every inch of it, from the long mundane marches through the jungle, to the sudden and brief firefights that can turn men into martyrs or monsters, to the moments of almost inaccessible introspection from young men carrying the weight of their actions or inaction during wartime. Soldiers tell tales; to one another especially, sometimes to friends, family, or strangers. They exaggerate and understate, polish and muddy, spin and sell these stories to each other. 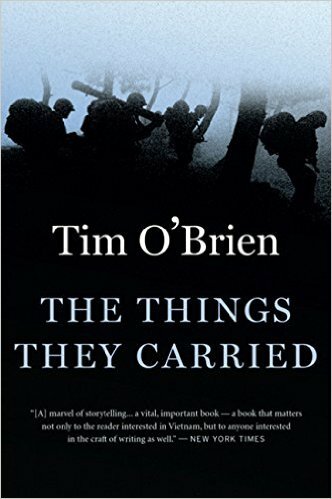 ‘The Things They Carried’ recounts this with an unflinching eye and holds it to the highest standard. It’s brilliant, somber, hilarious, horrific, and hard-hitting. O’Brien’s writing is top notch with an incredible pace and flow that wastes no reader’s time. In short, it’s a soldier’s storytelling written with a master’s hand. This author is one of THE guys to be reading; the real deal, no charlatan or knock-off here. So, what stopped this from receiving a full five stars? Well, there’s a well-known bit of writing advice I’ve always considered imperative: Show, don’t tell. These short stories occasionally give way to written pieces from the author that come off more like essays, afterthoughts, and articles of insight. Personally, I thought these were unnecessary more often than not. O’Brien’s storytelling does not need a soapbox on the side. They speak for themselves in volumes. These seemingly additional (and somewhat out of place) pieces scattered through the book takes away from the rest of it. But that rest of it is almost unparalleled. When O’Brien is telling a war story there is no doubt he is in his element and in total control of his craft. ‘The Things They Carried’ comes in a damn close second to my favorite novel about Vietnam (if not in general), ‘The Names Of The Dead’ by Stewart O’Nan. If this book is at all on your radar, don't do what I did and put it off. Make it a priority. You'll be glad you did.